1st row: Doris Shene, Jessie Strate Barraford, Ethel Storrin Wright, Mildred Hepburn, Ruth McCollum, Charlyn Kaufman Farrell, Margaret Pratt, Elizabeth Teepell Murphy. 2nd row: Dorothy Snell Cornell, Mary Shene Hubbard, Eva Straight Dean, Olive White French, Zelda Thomas, Pauline Leonard Snell, Belle curtis VanBuren, Esther Davenport Hutchinson, Florence Stowell Curtis, Doris Horning Greenfield-Teachers. 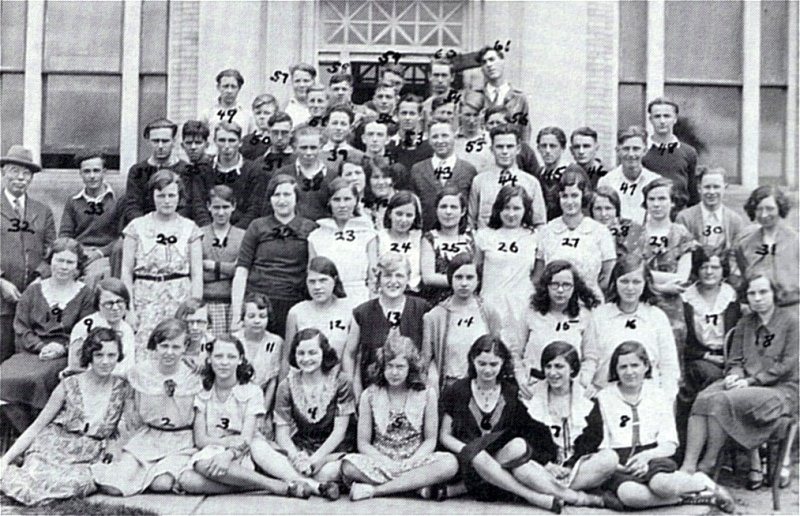 3rd row: Virginia Snell (teacher), Vada Williams Gillette, Electa Moore Cook, Lois Reed, Ema VanSant, Agnes Fox King, Frances O’Brien Williams, Genevieve Hepburn Mitchell, Charlotte Kaufman, Matella VanAtter, Mary Burt Dover, Kenneth Giffin, Iva Ruth Clark. 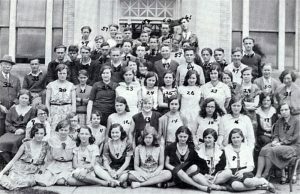 4th row: Forrest H. Gibbons, (Principal), Leon French, Louis Hutchinson, Lois LaBarge, Louis Whiteford, Harry Hickok, Charles Van Fox, Wesley Scouten, Julia Scouten Sherman, Worth Dygert, Josephine Burnett, Donald Snell, Karl White, Bernard Williams, Roy Taylor, Herbert Hatch, Wildred Greenfield. 5th row: Sanford Chase, Vernon Allen, Rexford Whiteford, Harvey Hickok, Carl Moore, Horace Paro, Donald Whiteford, Howard Hance. 6th row: Gregory French, Raymond Smith, James Kirkbride, Bernard Hutchinson, Raymond Town.